Alkenes are found throughout nature. They form the basis of many natural products, such as terpenes, which play a variety of roles in the lives of plants and insects. The C=C bonds of alkenes are very different from the C=O bonds that are also common in nature. The C=C bonds of alkenes are electron-rich and nucleophilic, in contrast to the electron-poor C=O bonds of carbohydrates, fatty acids and proteins. That difference plays a role in how terpenes form in nature. Alkenes, or olefins, are also a major product of the petroleum industry. Reactions of alkenes form the basis for a significant porion of our manufacturing economy. Commonly used plastics such as polyethylene, polypropylene and polystyrene are all formed through the reactions of alkenes. These materials continue to find use in our society because of their valuable properties, such as high strength, flexibility and low weight. 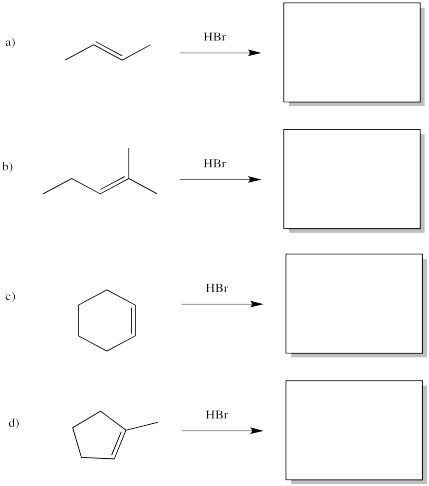 Alkenes undergo addition reactions like carbonyls do. Often, they add a proton to one end of the double bond and another group to the other end. These reactions happen in slightly different ways, however. Alkenes are reactive because they have a high-lying pair of π-bonding electrons. These electrons are loosely held, being high in energy compared to σ-bonds. The fact that they are not located between the carbon nuclei, but are found above and below the plane of the double bond, also makes these electrons more accessible. Alkenes can donate their electrons to strong electrophiles other than protons, too. Sometimes their reactivity pattern is a little different than the simple addition across the double bond, but that straightforward pattern is what we will focus on in this chapter. 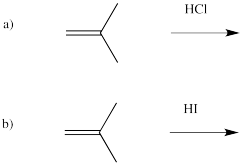 The reaction of 2-methylpropene (or isobutylene) with HBr, as depicted above, is really a 2-step process. Draw this mechanism again and in each of the two steps label both the nucleophile and the electrophile (so, that's four labels). Draw a reaction progress diagram for the reaction of 2-methylpropene with hydrogen bromide. Predict the rate law for the reaction of 2-methylpropene with hydrogen bromide. Based on the reaction shown above, draw products for the following reactions. Acids other than HBr can add to alkenes. Based on the reaction with HBr, draw products for the following reactions.